Fishing has been pretty tough over the past few days. A high pressure system moved into Northern Nevada and with it brought sunny skies and light and variable winds. It is common for this type of weather to slow the Pyramid fishing way down. Pyramid like many stillwaters can be effected on a daily basis by the weather. The overall fishing conditions at the lake are really good right now and there have been some really good fishing days in the past couple of weeks. On days like we have had this week there are a few things you can do to improve the fishing conditions. Fish first light and last light. A lot of times when there is a really sunny day and no wind the fish will move into shallow water while the sun is down. This was definitely the case on Monday and Tuesday. Try to get the wind (if any) in your favor. Sometimes the wind will blow on one side of the lake or the other. If this is the case follow the wind and try to fish in areas with chop on the surface. Be ready when the conditions change. Conditions change on a regular basis at the lake and it is important to observe the changes and be ready to fish when they do. If you are at the lake all day you may only have a 2 hour window when the fish are feeding. 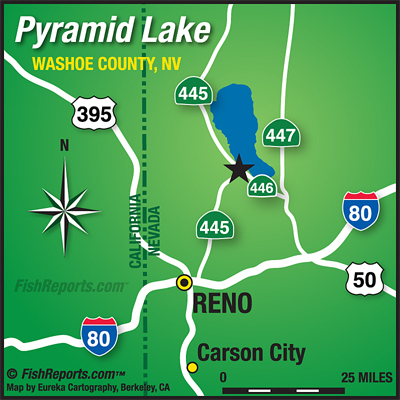 These tips will help to make you a better angler at Pyramid on a regular basis. There is some weather expected to come into the area as early as Friday and through the weekend. This should improve the conditions and there will be a few good days to fish in there somewhere. Slow stripping Wooly Worms, Loco Beetles and Tadpoles continues to work really well this fall. There is still some weeds and grass on the bottom on many beaches and flies with foam in them can really make a difference. Nymphing is also worth a try. Maholo Nymphs in Red or Wine fished on a floating line with or without an indicator has been effective as well.